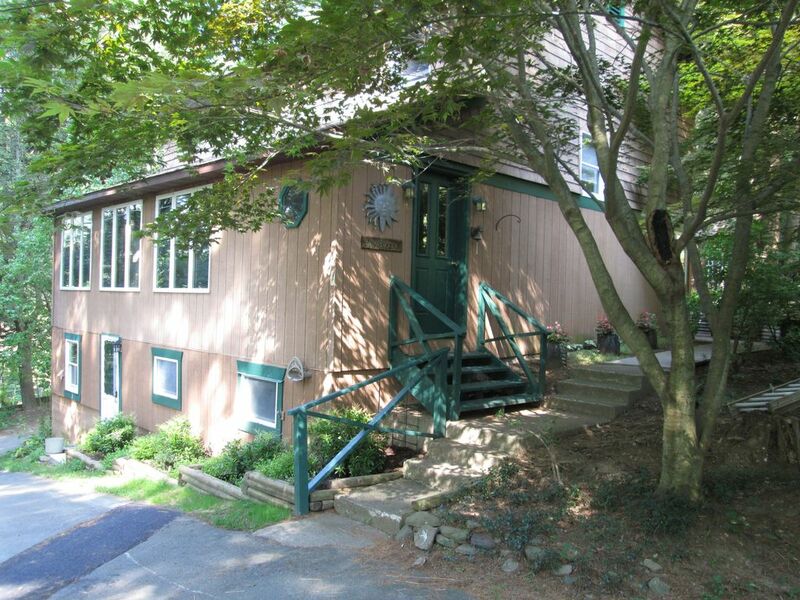 Lovely 3 bedroom, 2 bath house overlooking the Delaware River, 1 mile from the town of Narrowsburg, NY. The 1st floor has an open floor plan with a wall of windows overlooking the Delaware River as well as a cozy sunroom, full bath, fully equipped modern kitchen and outdoor deck, gas grill and garden. 2nd floor has 3 bedrooms (2 queen beds, 1 twin bed and 1 full bed) full bath, linens provided. Air conditioning, WIFI, Cable TV & DVD player provided. This peaceful retreat, the perfect getaway, is situated up on a hill, 1/4 mile from the public river access, 12 miles from Bethel Woods Performing Arts Center and 1 mile from the quaint town of Narrowsburg, NY. Only 2 hours from NYC. This property was part of Peggy Runway Lodge, our grandparent's resort which operated from 1929 to 1976. This was a family owned business and we all spent our summers in this area working at the resort. Since then it was a private home. We have now renovated and are filling the house with history of the bygone days of the "Lodge" where we all share fond memories of our time there. This house started out as a vacation cottage and we are bringing it back to it's roots. We are so grateful for the opportunity to stay in such a beautiful house that offered a home away. The property was spotlessly clean and well maintained as well as tastefully decorated with family mementoes and treasures creating such a welcoming homey atmosphere that we so appreciated and enjoyed. We would love to stay here again. We are so pleased to have guests like yourselves stay at our home! Thank you so much for choosing us...come back anytime! Peggy Runway Lodge was wonderful. Every detail added to the satisfaction of our weekend. If you think this looks inviting in the photos, just wait till you get there. Like being in a tree house. Very clean, beds were made with crisp cotton sheets, and very comfortable mattresses. Bose sound system with dozens of CD’s, cable TV...books aplenty to browse, layout had the nooks and crannies that are so inviting...just great. And so close to Narrowsburg..my husband ran there both days...1/2 mile from the bridge. We hope to be back often. We are so glad you enjoyed your stay! It's so nice to have guests who appreciate our house and the care we take to keep it nice. Come back anytime you are always welcome! Stop Looking !! Lauren's home is awesome !! Close to Bethel ("Woodstock") ! We are so happy you enjoyed our house! We look forward to you visiting again, you were the perfect guests! This lovely home had all the amenities to be an ideal vacation get away. The kitchen was fully stocked with all necessary cooking supplies. The space was beautiful, clean, artistic, and homey. Perfect. The road is tricky to find at first because it is a very small road. Coming from the Narrowsberg side there is a big yellow sign that says school bus. Turn and go up the hill, follow the road left at the first corner to find the right house. So glad you enjoyed our house. Our road is a bit tricky to find. I try to give each guest specific directions which has seemed to work well. Sorry you had trouble, hope to see you again!